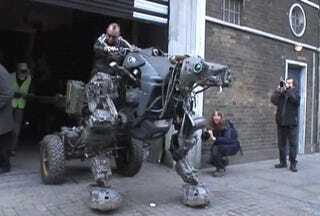 While nothing matches the spooktastic BigDog for infusing terror-or hilarity-into the population, this fire-breathing RoboDog-half Mad-Max bike, half AT-AT-probably comes in second place. But as the video shows, Larry is a good guy. Made by London's Mutoid Waste Company in four weeks, Larry is a walking robot made out of spare parts and a Citroen 2CV engine-an old popular car in Europe that probably nobody knows in the US.